With all the talk around and instructional how-to’s of achieving viral status, it’s easy to become focused on how to be the next big talking point on Buzzfeed. Don’t we all want to be positive click-bait in somebody’s Facebook feed? Melissa’s experience at Allstate has shown her that while these unicorn posts garner loads of clicks and impressions, they do very little for conversions in the long term. It’s the hard working, everyday content that will ultimately push your brand beyond all your viral counterparts. Understanding and embracing the content that regularly converts over the content that collects clicks can mean turning your back on the latest trends. We all want to use the newest tips and tricks and stay current. However, if those tools only serve to distract from the content that works, is it really that helpful? Or is it pushing away purchasers in favor of content rubberneckers? In the end, the content that converts is king. As a content leader, and as somebody whose thinking about creative ideas for what to write or what to show, where do you get kind of inspiration from in your personal life? I try to be active on social media and see what people are talking about. I really just try to be a good consumer of content, myself, both on the internet, and on TV, and on social, just to kind of, you know, it always helps to get those ideas going. Tyler: Welcome to another episode of Content Pros. My name is Tyler Lessard from Vidyard, and I'll be your host today. 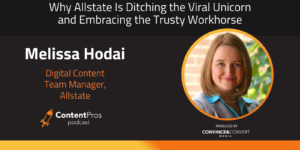 We don't have the lustrous Randy Frisch with us, but I think we're going to be okay because we do have Melissa Hodai from Allstate, who I think comes from a very interesting background in content marketing. 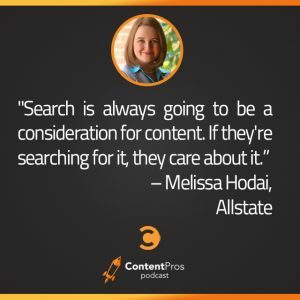 Melissa's part of a team that is running content marketing within the search part of the organization, and there's some very important reasons for that, and I think some interesting nuances to how that drives the way they run a content marketing organization within their business. So, without further ado, Melissa, would you mind introducing yourself, and giving our listeners a little bit of background on where you're coming from? Melissa: Sure. Hi, I'm Melissa Hodai, and I manage what's called the digital content team at Allstate, the insurance company. We are responsible for two major, or the two main digital marketing platforms here at Allstate. The Allstate blog, which is what we call our more top of funnel platform. That's where we give safety tips, and car maintenance tips, and all kinds of tips to help people build relationships with people, who may one day want to buy some insurance, but we don't talk about Allstate, or it's products on the blog. The second platform that we manage is called the tools and resources section of allstate.com. That is what we call our mid funnel platform, in terms of the sales funnel. That is basically a general insurance educational library, so all of the content in that section answers peoples frequently asked questions about insurance. Someone googles something like, what is comprehensive coverage, or if a tree falls on my house is that covered? We have content to answer those types of questions there. Those are basically our two main platforms. 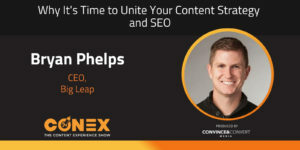 Tyler: Before we dive into some of the meat with respect to measurement, how you guys measure success, and I think some interesting things that we'll pull out for how you focus on search and SEO as a core to your content strategy. I want to get to know your audience a little bit better, so who do you target with your content being an insurance company? Is this individual consumers? Is it a B2B play? Is it a little bit of both? How does that influence the way you approach a content strategy? Melissa: It's a little bit of both, but I would say the majority are going to be the individual consumers. We do sell small business insurance, so we do have some business owners who we target with certain content, but the vast majority is going to be our consumers. Tyler: Got you. Okay. I think that also answers part of my question about how did your team come to be built within the search and the SEO part of the organization, I know a lot of companies’ content marketing sits separately in different areas, but it was very interesting to hear that your team really got spun up within the search part of the organization, and I presume that was to help build a blog to drive more inbound traffic. Melissa: Absolutely. Yeah. About six years ago the head of search saw the opportunity, the Allstate blog had existed in a different form, it was more of a community at the time, but knowing that content is search is content, he saw the blog as a great opportunity to widen that net and get more inbound traffic for the digital universe here at Allstate, and then the tools and resources section kind of followed. That section also already existed, but especially if you think in terms of the types of terms that we would like to attract. The searchers, they're looking for insurance related content, so that gave us a really good opportunity as well to attract people who are in the right mindset. Tyler: Right. Yeah. How does that influence the way you think about your content calendar, both on the blog, as well as in the tools and resources area? Are you focused on SEO keywords, and search terms as to guide your content calendar, or are you looking at other cues from the market to understand, which topics are most likely to really hit and resonate out there? Melissa: We did both. So, search is always going to be a consideration, and if we get an idea from let's say another area of the organization that would like to talk about a specific topic, or something that's going on in the world, in the news, we always use certain tools to kind of check, you know, what's the search volume? Are people really looking for this? Because to me that's a really good Litmus Test for is this something people care about? If they're searching for it they care about it. Everything that we do, we make sure that it's done with the consumer in mind, not necessarily just because it's something we want to talk about. Tyler: Right. Yeah. Yeah, I think it's such an important piece, and a lot of folks can get caught in the trap of just thinking, okay, we've got a blog, we need to publish two to three, or four blogs per week, whatever your cadence is, and you can quickly get into the trap of just content for the sake of content to fill a calendar, but I think if you debate too far from that baseline of is this A, going to drive success from an inbound search perspective, and B, answer questions people really have out there. It can lead you in a very dangerous path, and one that doesn't align back to the goals of the business. Right? Melissa: Right. We always try to think to ourselves, is this going to help somebody? Does somebody want this content? Melissa: Is there a good reason to create this content? If we cannot come up with a really good reason, we don't do it. That's just kind of how we make our decisions. Tyler: So, you guys recently won an award for your blog, if I understand correctly. Can you tell me a bit about that, and what was the award recognizing? Was it the content? Was it your measurement in analytic strategy as a business impact? What gets you proud about what you've done with your blog, and how you guys have fueled success? Melissa: Yeah. We won the best corporate blog award from the Content Marketing Institute. 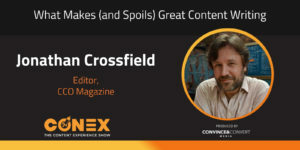 I think that they're wrapping up Content Marketing World a few days ago. Melissa: But, you know, so they just announced this pretty recently. We're really excited. To me, I think it basically looked overall at corporate blogs in terms of strategy, in terms of the kind of content that they're creating. Melissa: And, the goals that they're meeting. To me, it was a really big achievement, because I feel like in the past five years, since the blog really was born in its current form, we've really made huge strides in terms of our strategy. Basing that strategy on data, and then seeing the results that, that does, that, that has given us. Our strategy has really evolved over the last several years, and I think that we've finally gotten to a place where we know what we're trying to achieve, and we're learning every single day how to better achieve that, and the award was really an exciting thing for us, because it kind of validated what we had felt was success for us. Tyler: Right. I think you touch on such an important point, which is what are the success factors for today's blogs? And, is it, again, is it measured by the volume of traffic that it's driving the engagement of audiences in the content and time on page? Things like that. Or, how it is ultimately converting and driving business value and back to the line of business goals. Can you talk a little bit about your journey to understanding the best way to measure the success of your blog, and to use those insights to fuel what you're doing, and to create a blog that truly has been a success for your company? What's your journey been there of going from sort of I guess early days of I assume pretty basic metrics to where you've come to, which sounds like you're on a good path? Melissa: Yeah. It has been quite the journey. In the early days, we've always had two core metrics that we've looked at, but we've really gone from taking into account in the early days we would look at those two metrics, but then every other metric that existed. Whereas, now, we've really honed in on those two things as the main things that we really need to focus on. In the early days, we would do what I would call unicorn hunting. Melissa: Which to me a unicorn is one of those pieces of content that it gets out of nowhere a million YouTube views when you normally get like a 1,000, or it gets just insane visits, or insane talk on social compared to everything else. It's that huge spike, and everybody wants to be able to make that happen on a regular basis. It would be lovely if everybody could have that Oreo moment, or whatever at will. But, we would do a lot of, you know, whenever one of those would hit, we would basically just drop everything and do whatever we could to make that happen, again. It wasn't super successful for us. I mean, we were doing okay, but we realized over time, after several of these experiences that you cannot catch that lightning in a bottle, twice. It's often a mix of the topic, and the time, whatever people are talking about at the moment, whatever zeitgeist does at that particular time. It could be the way the stars align. You cannot even predict it. We decided to do whatever we could to really base our strategy on hard data over a long term basis, not just that one spike, but what does well consistently over months, and months, rather than what did well that one time on that fluke-y basis. So, we kind of evolved into what I call like a middle stage where we were looking at all the data, and there were so many metrics available to us. We were very lucky to have all this information, but we would look at everything from just the basic traffic, and referrals, and where's the traffic coming from and all of that. We would look at the engagement metrics, both on page and in social. What would get us the most Facebook shares? What would get us the most Facebook likes? What would get us the most retweets? What would get us on page engagements? Et cetera. We were trying to find kind of the perfect blog post. What would be the perfect storm? Is it like an infographic about auto insurance that was promoted at 7:00 a.m. on a Monday? We were trying to find the perfect mix of things. That also kind of backfired a little bit, not backfired, but it was just very overwhelming, because when you look at all the different metrics, each one had a different answer. It would be like, well, auto related stuff will get you the most shares, but infographics will get you the most clicks. So, basically the answer to that perfect, what is the perfect post was it literally had to be everything. Every topic, every content type promoted in every single way, and that just wasn't, I mean, it's obviously, it's not connectable. Tyler: That's the infinity post. Melissa: Right. It would just be like this chimera with everything in it. So, we stepped back again and we said, "Okay. What really matters to us? 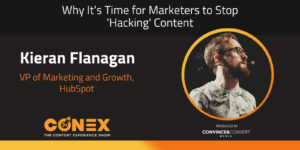 What are the things that we really want to accomplish with our content marketing and we need to look at those things, and make our strategy based on those things." So, we did that, and our two, those two main KPI's that have always been a thing for us, always been very important to us, our visits, we're trying to get people to the digital realm of Allstate, and conversions. We have conversion events that we've always paid attention to, sending people to the quote, sending people to the agent locator, and sending people to the agent websites. Once we stripped all that other stuff away, all those other metrics that are interesting, and helpful, but not necessarily the thing we were trying to accomplish, once we stripped all that away, and we just focused on visits and conversions that really gave us a good idea of what we should be spending our efforts on, and how we should be doing it. Tyler: Yeah. I think that's, I mean, it's super interesting, because you're right you can get totally blogged down in all these different leading indicators, if you will, of what feels like success for a post, or a piece of content, and those are largely those sort of traditional, I hate to say, vanity metrics, but that's kind of the way we often think about them, of shares, and views, and likes, and whatnot. But, coming back then to those conversion points and what's driving the intended action, or influencing that. So, are you guys looking at that from an immediate perspective and saying, "Are you driving people right from your blog in those posts to take those actions?" Is that like a primary CTA within the post, or are you expecting people are going to interact with the blog perhaps then go off, come back at a later time and they may convert some other time down the path? How do you relate that back to the blog post? How do you make sure you're still capturing those people? Melissa: We don't really expect it to work that way. We know that our content is part of a long-term relationship that we're trying to build with people, you know, with consumers. We devised an attribution model, an “any-touch” attribution model is what we call it, and it's a way to measure if someone visits the blog, and then comes back and converts somewhere in the Allstate's digital universe within a certain amount of time, several months, we can attribute that conversion back to the blog, so basically we can say, "The blog was one of the steps in the process that took that person from entering the digital universe at Allstate to converting and becoming a customer." Tyler: It's just not the case, but we also know that those who do educate over time are more likely, and then we've started to do the same of identify, well, which topics are the ones that are early indicators of somebody who may be a longer term prospect, and then convert somewhere further down the line. I think it's super important, because we cannot lose sight of those programs that are influencing longer term deals as opposed to generating immediate responses, or pipeline at the time of. We're going to take a quick break, here, so we can get a couple words in from our sponsors, but when we come back I want to dive a little bit further into that, Melissa, and I'm going to put you on the spot a little bit, and ask you about some specific tools, or methodologies you're using to actually put that into action. So, stick with us here, and we'll be right back with Melissa. Welcome back to the Content Pros Podcast. We're here with Melissa Hodai from Allstate Insurance, and we just started talking about attribution, and influence modeling, and the idea that a blog is not only responsible for driving inbound traffic and engagement in the content, but ultimately to help drive the conversion points you're looking to achieve in your business. For us, a company like Vidyard, it might be a demo request, it might be another sort of bottom of funnel action to signup for a trial. In your world, Melissa, you mentioned a few very specific actions. You're looking for people to get a quote, or to engage with an agent. I want to peel back just a little bit further to help people understand how you're doing that in practice, and while I recognize you're not the one managing all the marketing type underneath the covers, from your perspective as a content marketer, who are you working with in your organization to make sure you can do this kind of tracking and reporting? How are you guys collaboratively using those tools to make sure you're understanding, which content is actually influencing opportunities and ultimately revenue for the company? Melissa: Yeah. We work really closely with, there's an internal marketing measurement team, and they've managed to create this wonderful attribution report that we use. I do know that it's based basically on cookies, so they cookie people and that's how they know when they come back. We use SiteCatalyst, and also Google Analytics to another extent to keep an eye on what's going on with our traffic. Tyler: Right. Can you think of any, and again, I'm going to further put you on the spot here, but can you think of any examples that you could share with the audience about, I'd say one or the other, a piece of content, or a blog post that you thought was going to be the unicorn, and it later on you found out from that attribution data that, yeah, well, it seemed to be great, and it made us all feel warm and fuzzy, it didn't really impact results, or on the flip side, a piece of content that just seemed like an everyday thing, but ultimately you realized, wow, that really had an impact on revenue? Did you sort of get visibility or understanding of why one of those over performed, or under performed? Melissa: People with backyards have homeowners insurance, and they might want chickens. We did this story, and it got just so many visits. It got 50 times as many visits as everything else. We like visits, visits are a thing that we really care about, but it didn't really lead to a bunch of conversions for us, and it didn't lead to a bunch of people coming back to Allstate's digital universe as we wanted them to do. So, it was something that looked great on the surface, you know, when you say, "Oh, this post got X number of hundreds of thousands of visits," but it really didn't pay off in the long run the way that we would want some of our content to do. You know, I think on the flip side there's pieces of content on the tools and resources section, especially, that we just did thinking, well, someone's going to search for this, that'll be good, and the one that I'm thinking of is, what is full coverage? People search for that all the time. Melissa: The answer is, there isn't any such thing. Melissa: So, we didn't, it's not like a product that you can go buy, that's called, full coverage. Melissa: So, we created this piece of content to kind of debunk the popular term that people use, and we thought it would do okay, but really over time and that post has been up for several years, now, and it has been a powerhouse. Every year it consistently delivers. We'll give it updates from time to time, but tons of search traffic. It gets conversions. It's just an amazing post. That was one that didn't seem so flashy, or kind of strange, and as much of a talking point as the chickens, but it was really work horse, for us. Tyler: Yeah. It's interesting, and I think one of the things that sort of jumps out at me is the chicken farming, I do have a neighbor two houses down that has chickens in their backyard, and in fact I was more interested myself in how do I protect my own home from the chickens, but I'll leave that for later. Tyler: But, to me as a marketer, I think it's a super top of funnel piece. Right. And, to your point, it's likely to get really broad traffic, but somebody searching for that doesn't feel like they're close, or anywhere near a potential buying stage, or somebody that may be sort of qualified. The second piece that you talk about, understanding what full coverage means feels to me like that's going to be somebody whose further down the intent cycle, and they're asking questions that are more specific and therefore again more likely to be a quote on quote, bottom of funnel prospect whose more likely to convert in the near term. Tyler: I was going to say, it's something that we've tried to do, I think, in our own programs is think about that, where we do want to spread it across the board, because we still do, you know, there's value in audience building with that really top of funnel content, but making sure that we are also focused on that, again, bottom of funnel style content, that's really specific to topics that are key to our personas. Melissa: And the need of the people who really have the questions, and the intent. Tyler: Yeah. I like that. Let me ask you then to shift a little bit to the type of content that you guys are investing in, so I suspect that there may be a different answer with the blog versus the tools and resource section, but let me just throw that out there of between the written word, you know, you mentioned infographics, I'm sure you are looking at videos as part of your content strategy, and other sort of snackable formats, what are you guys seeing today, and what's working well for your team? As you look ahead, what's on the next frontier? Where do you think things are going for the kind of content that's going to perform well on your sites, independent of perhaps the topic? Melissa: You know, I have a boring answer, but it's again one of these like work horse type things. To me, the blog post, the article has always been, and I think it should continue to be one of the hardest working pieces of content for us, or types of content for us. Melissa: I don't know how you say that one. We've tried all these kinds of content, and you know to their own degrees of success. Melissa: Some of them do well for us, but at the end of the day, and maybe it's because of search. You know? Melissa: Augmented reality. All of those things, as well. Tyler: Yeah. I think that a 360 video to refresh and support that chicken farming blog would probably work well. I mean, I would probably want to look around and see how do I build the coop. Melissa: Whatever they do, I don't know. Tyler: But, I think you make a great point that I again, I hate to just keep agreeing with you, but that all happens when we're speaking with like minded folks, but that blog as the real work horse, and where you can have a frequency of content, where you're touching on so many different topics, and reaching audiences of different styles with longer form, shorter form content is going to continue to be the work horse, but I do also agree that there's always flexibility in the kinds of content types we can include within those blog posts to cater to different audiences, so that's where I tend to agree. I don't think that it's one or the other. It's infographics, or videos, or blog posts. I think all those things are just really merging together, and you're saying, there's a time and place for the work horse, text only, keyword centric, really have a style blog articles, and then ways to complement it and support it with short videos, you know, short fun little graphics, infographics. Things like that. That stuff gets me excited when these sort of things come together, and you can appeal to different audiences with different styles of content. Melissa: Absolutely. That's something we've been experimenting with a little bit on some of our past posts that as articles did well. We're seeing what can we add to those, or do to those to maybe try to widen their appeal even further. You know, adding a video, or a gif, or whatever, or some visual component to those articles to say, maybe somebody wants to see this content in another format. Tyler: And, kind of how some that relates back to what you're now doing. Let me ask you as a content leader, and as somebody whose thinking about creative ideas for what to write or what to show, what do you in your personal life, where do you get kind of inspiration from? Are there shows on HBO or Netflix that kind of really get you going? Are there people out there? Is it cooking, or some other creative outlet that really helps fuel that side of what you do day to day? Melissa: And, see what people are talking about. I watch a lot of HDTV, and those types of channels, thinking about the type of content we do. That's always a good source for ideas. I really just try to be a good consumer of content, myself, both on the internet, and on TV, and on social, just to kind of, you know, it always helps to get those ideas going. Tyler: Yeah. I think, back to Game of Thrones, not surprisingly, I'm a huge fan, myself, but I find there may not be specific inspiration moments, like, oh, yeah, I should do something with the drive-in, but what I love is just with shows like that and there's Westworld, I was of course a great fan of. Then there's so many now that to me just are so inspirational from a storytelling perspective that, that stuff I love, too. Right? It's just like Sunday night I can get into that mood and I walk away, and I often do, I think back sort of as we're talking about different kinds of content, it's just that underlying inspiration of good, strong storytelling, how your sort of thinking about characters in your narrative, so those things I think are just good inspiration for all of us to keep us focused on telling good stories that appeal to our audiences in different ways. Right? I think one of the other things I will say is I'm looking forward to the upcoming season of Stranger Things. Tyler: Just a little tip for anybody else out there, too, there's lots of different ways you can play off of Stranger Things, or a great Halloween blog post, or a video, so I'll leave you with that one. Melissa: I will have to check that out. Tyler: Yeah. Thanks again, Melissa, I just wanted to really thank you for spending the time here with our audience and giving a little bit of background on where you've come from with your team and some of the success that you've seen. Again, congrats on the well deserved recognition for your blog, not just for great content, but for being able to show meaningful results beyond just clicks and views into real attribution, and to revenue, and I think it's something that all of us here should continue to strive for. For anybody that wants to follow you, or what you're doing, Melissa, can you point them to where they should go, either your LinkedIn profile, or maybe the Allstate blog, so they can see what you guys are doing? Melissa: Yeah. I think the Allstate blog, so blog.allstate.com is a great place to go. Check it out, please. Thank you for having me. Tyler: Perfect. It will be even more inspirational than Game of Thrones, I promise you. That's great. Thanks again to Melissa for joining us, here. This has been another episode of Content Pros, part of the Convince and Convert family of podcasts. Services and training classes all designed by Jay Baer, and his team to help you all be more successful, and effective modern marketers. If you enjoyed this episode, please check out the rest of our content at contentprospodcast.com. You can find us on iTunes, Stitcher, Google Play, or wherever you find your podcasts. If you are listening and have some comments for us, either what you've enjoyed, or what you think we could do better, please leave us a comment and let us know, so that we can continue to improve what we are doing here at Content Pros. With that, we'll sign off for today, myself, Tyler Lessard at Vidyard and on behalf of my dear friend Randy Frisch from Uberflip thanks for joining, and we hope to catch you next time. Thank you.